With the countdown to Brexit deadline day well and truly underway; British Prime Minister Theresa May is preparing to meet with Labour opposition leader Jeremy Corbyn, in order to try and reach a compromise over her Chequers plan and finally get the proposals through parliament. But is this even a realistic possibility given the increasing tensions between the two? Sputnik has discussed the issue with Eddie Bone, Director of Campaign for an English Parliament. Sputnik: Is a no deal Brexit now inevitable and would it be as bad many fear? Eddie Bone: First of all; I think that not even our politicians can explain really what’s going on at the moment. I think we’re looking at just as much of a betrayal of Brexit, as much as a no deal, there is quite a wide talk of an extension of Article 50 being on the cards, and it’s just such a constitutional mess that no one really knows. 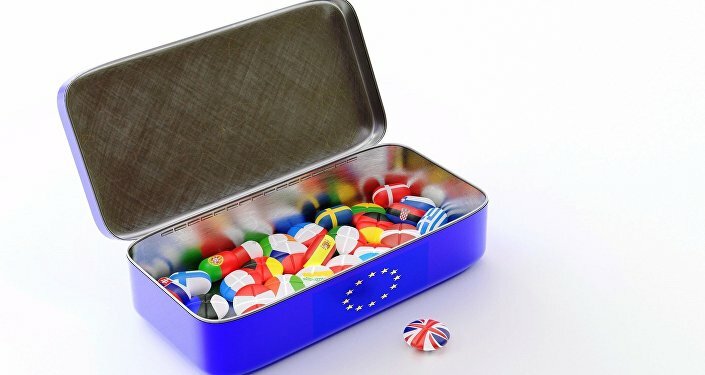 As for a no deal; I don’t consider it to be a no deal, I consider it to be the UK going on to World Trade Organisation terms, I don’t look at it as crashing out of the EU, I think that’s a biased term used to frighten people. What we are sure of; is that there is a constitutional mess at the moment. For the first time Sinn Fein are calling for a border poll, that only happened last week and the UK government rejected it, but that’s only a matter of time before that does actually occur and there’s an attempt to re-unite Ireland; which means that Northern Ireland would no longer be part of the UK. Sputnik: Jeremy Corbyn appears to be very critical of Theresa May, but would Labour have handled Brexit negotiations differently? Eddie Bone: We’re just looking at a political elite that is showing itself up to be incompetent, and that is all the main political parties. Every single one of those parties has ignored England; and England was really where the Brexit vote came from, and yet Labour, the Conservatives and others have no intention of engaging with England or English concerns that Brexit won’t be delivered. Labour would be in exactly the same boat; It’s just urgently needed now for a new constitutional government, and that has to be an English government, so an English government can reflect what the people of England are saying, same as what the Scottish government could reflect what the Scots are saying. That would mean that there would be a United Ireland with its own government separate from the UK. Views and opinions expressed in this article are those of Eddie Bone and do not necessarily reflect those of Sputnik.